their way to and from school. Summer uniform should be worn in Terms One and Four. – Trousers – or slacks – tailored navy gabardine or tailored grey shorts. – Shirt – sky blue, short sleeves, open neck. – College Pullover – Year 7-9 Thomas Moore Blue V-neck. Year 10-12 Navy blue. – Socks – Plain white colour . Long or short. No logos or branding visible. No black socks. No tights. – Hair ribbons – plain College blue or plain white. – Shoes (polishable) ONLY black regulation lace-up or T-Bar shoes. No platform soles or non-polishable shoes. Summer uniform should be worn in Terms One and Four. – The designated College check skirt, or slacks – tailored navy gabardine. – Shirt – sky blue long sleeves, open neck. – A plain white T shirt, without logo, may be worn under the shirt. – Socks – Plain white colour – long or short, or navy blue or black pantyhose or tights (no black socks). – Navy blue shorts with College logo. – College Sports top with school logo. – College navy blue tracksuit pants. – Trousers -plain College grey regulation. – Pullover – Year 7-9 Thomas Moore Blue V-neck. Year 10-12 Navy blue. – Shoes – polishable – ONLY black leather. – Skivvy – sky blue, non-ribbed may be worn with or without shirt. – Shoes (as for Summer). – College Sports top with College logo. – Oxford Jacket – with College logo. Must be worn over the pullover. Only for outside the classrooms. – School Bag with logo – the East Doncaster Secondary College official school bag is a compulsory part of the school uniform. – Scarf – plain navy. – Gloves – plain navy. – Hat – plain navy. All articles to be marked clearly with your name. – Jewellery is not to be worn – only two plain metal earrings (stud or sleeper) may be worn. – No facial piercings are permitted. – Nail polish – clear, colourless only. – No make-up or unsuitable hair styles or hair colour. – Hair colour should be natural. 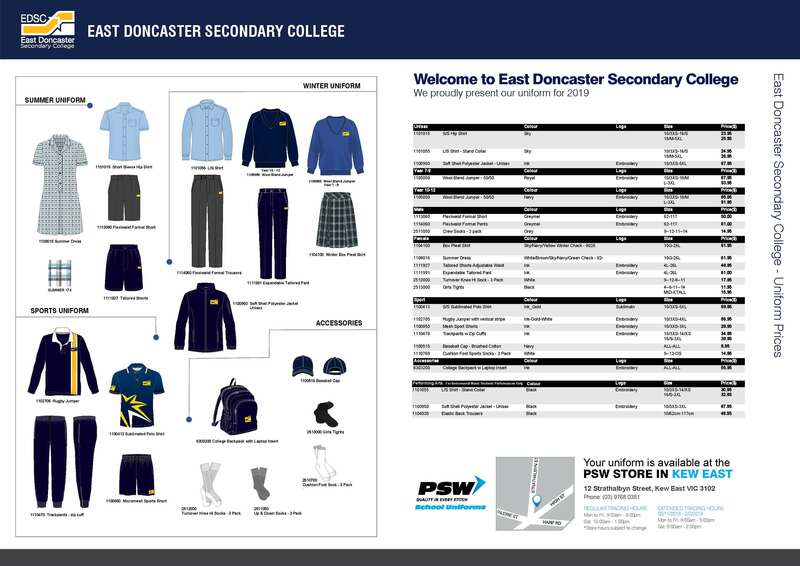 The official school uniform supplier is PSW. Click here to go to the PSW website.